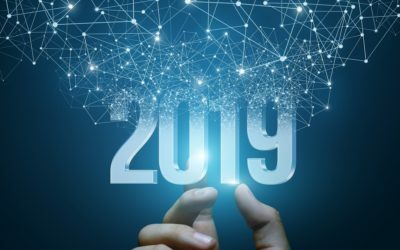 It’s the end of the year and you’re likely going through a few of your typical outreach activities -- sending out calendar magnets, holiday cards or setting up your email action plans. Why not spend a few extra minutes making these activities really count. Below, we offer five ways to go just a bit above and beyond when it comes to your end-of-year outreach and business planning. We guarantee that if you put in just a little more effort, you’ll quickly learn who’s looking to buy and sell amidst the contacts in your area and sphere! Now that you can easily access your clients’ Closing Disclosure, be sure to contact your 2016 clients to let them know that you’ll be sending over a copy they can use when they file their taxes. But instead of just sending it solo, try making a bigger impact with a small holiday gift. Drop off the CD in person with a bottle of champagne they can drink when their taxes are complete. If you’re not sure champagne would be appreciated, you could instead bring a wreath or poinsettia. 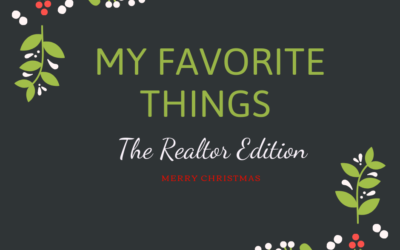 If your former buyer clients celebrate Christmas, consider sending their CD along with a tree ornament celebrating the first year in their new home. Here’s our favorite budget option, and a more expensive customized option. If you need an ornament yesterday, let Amazon Prime rescue you. 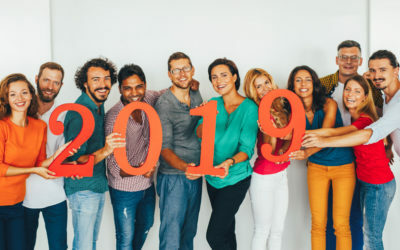 Most real estate businesses send out casual holiday cards either thanking their clients for their business, or wishing sphere contacts a happy and prosperous new year. 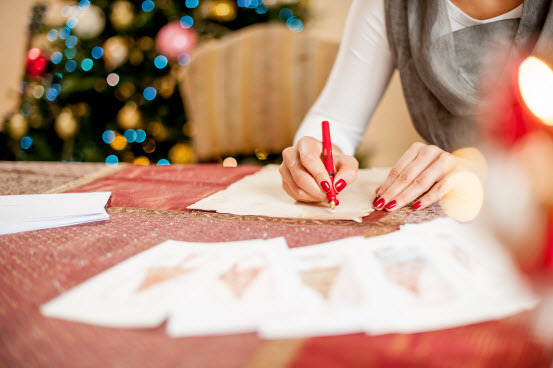 But here’s the $10 million dollar question: Do you use a printed signature, handwrite your signature… or do you take it to the next level by writing a quick note to each person receiving your holiday card? It’s okay if you’re guilty of a simple signature. We’re all busy and time is precious. At the very least, be sure to separate out this year’s clients, and those you hope to be a client in 2017, and write them a quick greeting. These people represent your best chance for future referrals and business so it’s important not to treat them like they are one of hundreds. Pssssst. If you’re super busy, you can also look into holiday card options with digitally handwritten greetings. Our SmartTargeting platform puts this technology to use for real estate agents who are sending prospecting letters. We can report that most agents report higher response rates and engagement when they include a “handwritten” note on these outreach letters. If you’re not a SmartTargeting customer, we recommend trying out Bond — right now, the company is offering 100 free cards to new customers. We’re not going to knock the refrigerator magnets — plenty of agents report that they get business from this inexpensive annual gift. But instead of just offering a calendar, why not also give your contacts something to put on their calendar? Select five contacts who you really want to be a client in 2017, and who you feel are likely to transact. Instead of just sending them that Marlins calendar, send them tickets to opening day! Again, even if you can’t offer that kind of generosity to every contact, you can at least target those who are most likely to offer a return on investment. Legal alert: Remember when setting up email action plans that you shouldn’t automatically set up contacts without their permission. Read CAN-SPAM rules here and make sure to only contact those who want to hear from you. Plus, be mindful and note those who are on the National Do Not Call Registry. SmartTargeting has partnered with Landvoice to provide phone numbers for contacts in an agent’s sphere or farm; Landvoice provides phone numbers when available and alerts agents which contacts on are on the registry. Take a deep breath and Google your name along with the keywords “Reviews” or “rating.” Hopefully what you see is a smattering of positive reviews from past clients, but if you are surprised to see negative reviews or rankings on sites you didn’t even know existed, it’s time to get to work. First, keep track of all sites where you have a review or want a review. Next, go through your 2016 client list and direct these contacts to the exact site URL where you’d like for them to review your services. If you had a client with a standout experience, ask them to copy and paste their review in a few places. Looking for a platform that can help boost the signal on your ratings? Check out RealSatisfied, a platform that allows you to collect feedback and reviews from clients, then syndicate these reviews across leading real estate websites. Ready to hit the ground running in 2017? These five tasks will help you go above and beyond your usual end-of-year tasks, but isn’t it also time to try something new? If you’d like to see how SmartTargeting helps thousands of agents to predict and win listings in their market areas and spheres, reach out today.